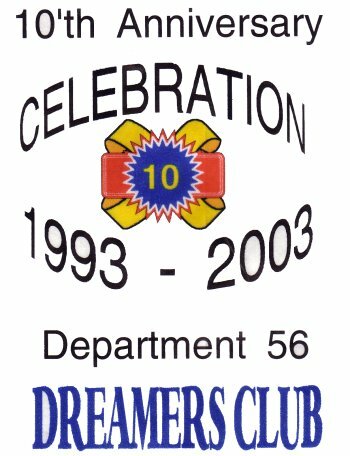 Department 56 Dreamers Collectors Club. Welcome to the Department 56 Dreamers website. We are a Department 56 Collector's Club located in north central West Virginia that was founded in February of 1993, by president Carmen Robinson. Our current president is Paula Moeller. We currently have approximately 35 members (and growing) with eight generous associate dealers. We welcome each and every one of you to join our club if you would like to, and live in the area. Look below for an online or printable D56 Dreamers application form. We meet six times a year, bimonthly, on the third Sunday of that month from 2:00 - 4:00 p.m. We also have a few special meeting dates throughout the year. Please look at our calendar below for the exact meeting dates and times. Our meeting place is usually the Waldomore in Clarksburg. A picture of the Waldomore is above, and a map to the Waldo can be found below. In 2003 we will have our meetings in differents areas of WV. The Waldo is under renovation, so please look below for exact meeting dates/places. CELEBRATING 10 YEARS 1993 - 2003!!! CELEBRATING 10 YEARS 1993 - 2003!! - D56 Rep will be present to show Mid Year Intros! - Please bring a covered dish! 2:00 - 4:00 General Meeting - Special Meeting at Riders! 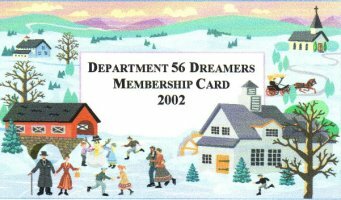 Interested in joining the Department 56 Dreamers? The annual dues are $10 yearly, per member. PLUS Name Badge and Membership Card (pictured above). Click here to print a copy of the D56 Dreamers application form. If you are a Dreamer and are online, please let me (Matt) know your name and email address. I can then add you to the listing of online members. Here is a map of Clarksburg. You can click on the map to zoom in closer. NCC Jack's Umbrella Shop The 2002 NCC Exclusive "Jack's Umbrella Shop" has arrived!! You can pick up yours at the June picnic. If you need it sooner or will not be able to attend the meeting, please contact Velva as soon as you can. Please take a minute and sign our guestbook! You are Dreamer # to visit this site! Hope you enjoyed our web page! Any comments are welcomed. and last updated on May 25, 2003.